As a mom, the rundown of your day’s activities can make you feel so run down you want to scream. When I can’t scream, I write, laugh, and drink plenty of coffee! Meet Mochu. He’s an animated penguin who takes his job very seriously. 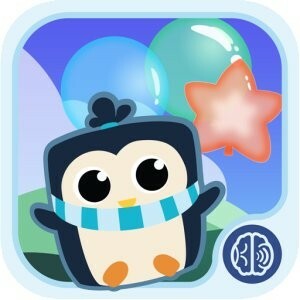 He wants to help your babies and toddlers develop and learn sounds. He’s all about great games and eBooks designed to entertain and engage your children and develop their brains. Kadho has developed Mochu along with a new generation of resources aimed at taking all of those “goo-goo gaga” sounds to the next level. Scientists and early childhood educators have teamed up to create a line of products aimed at making the most out of sound and language. Research shows paying attention to and distinguishing between sounds plays a pivotal role in how children learn as they get older. If you’re a little shy about using technology to help teach children, don’t be. It’s all around us and it’s not going anywhere. So why not use it to our advantage? In moderation, screen time can actually help a child, if monitored and used correctly. Take the Mochu Pop game for example. This game lets kids have the fun of popping balloons while hearing sounds that make up languages like English, Spanish, and Italian…just to name a few. While kids think they are just playing a game, they’re actually learning language skills that may otherwise be hard to teach. The game is geared for ages five and under. So, if you have more than one little person at home, you can experience different levels. Although the game is top notch, I have to admit, my favorite is the eBook, “Mochu Says Goodnight.” I love it for kids for several reasons. Let’s start with the storyline. Poor little Mochu can’t fall asleep. I’m sure many parents and children can relate to that problem all too well! So, he goes on a little journey to say goodnight to all his friends as he tries to fall asleep. Then comes the all-important words on the bottom of the screen. I find these helpful for toddlers learning words. They can see them as they are being read and match the sounds they are hearing at the same time. If that weren’t enough, they are hearing different words in different languages. You can monitor the sounds your child can recognize through Kadho’s parental dashboard. This allows you to keep track of what sounds from what languages your child actually knows. This way you know what you need to work on. It’s a great tool to keep your child’s learning organized and moving in the right direction. When it comes to teaching our kids, I think we need to be open to everything. Products like Mochu Pop and various eBooks are useful and unique tools that can only help your child succeed. I am a former news producer turned stay at home mom to two beautiful little girls. I'm busy 24/7 like most moms. Writing is my outlet to keep my sanity! I am a freelance writer, blogger, and 24/7 mom. I love to write about all of the craziness of parenting. Writing is my outlet to keep it all together! How’s That No Yelling Thing Working Out for You? App-sessed! How did our mothers ever survive? Copyright 2013 Kristina Cappetta. Development by devZio, LLC. All rights reserved.